MIRKA Abralon Sanding Discs are the perfect solution for tackling orange peel on paint and oxidation on gel coat. These unique sanding discs are composed of a multifunctional sanding material perfect for use on smooth, angled, and curved surfaces. The patented flexible construction of MIRKA Abralon Sanding Discs minimizes the risk of pressure marks and allows the discs to contour to curves and angles on body panels to ensure smooth, even results. Air and water pass freely through the flexible weave creating perfect results when used wet or dry, by hand or by machine. While virtually any sandpaper will scuff away major imperfections, the mark of truly great sandpaper is a smooth finish. After all, the end goal isn�t simply to remove imperfections; the goal is to restore the like-new look of the surface. MIRKA Abralon Sanding Discs make it easier to achieve smooth, consistent results on any surface, be it smooth or contoured. MIRKA Abralon Sanding Discs feature the highest quality abrasives to ensure maximum efficiency, speed, and finish quality with every use, while maintaining cost-effectiveness. These cutting-edge sanding disc options produce very little dust, revolutionizing the way that people think about sanding. 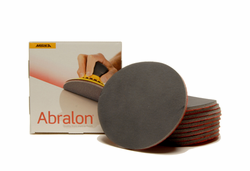 Each Abralon Sanding Disc features a fabric face, foam center, and grip backing with the abrasive grains spread evenly over the face. What�s more, each disc is designed to outlast traditional sanding papers reducing the environmental strain that an extensive restore can create. MIRKA Abralon Sanding Discs are backed with a foam interface, providing better control and increasing their ability to meet the many curves of body panels and boat hulls. When used, by hand or with a machine, MIRKA Abralon Sanding Discs help to level the area around deep scratches, creating a uniformly smooth surface that can be polished to perfection, often times eliminating the scratch completely. Use MIRKA Abralon Sanding Discs on headlights, gel coat, clear coat finishes, lacquer finishes, and any other surface that requires smooth, consistent sanding results.